Hit and run motorcycle accidents, unfortunately, are becoming increasingly common in Massachusetts and on the national stage. In fact, according to statistics from the National Highway Traffic Safety Administration (NHTSA), hit and run motorcycle accidents have increased 15 percent over the last decade. More alarming, is that the NHTSA reports that up to 700,000 car and motorcycle accidents each year are of the hit-and-run variety. Hit-and-run motorcycle accidents bring distinctive challenges, as the injured motorcyclist or the motorcyclist's estate following a wrongful death, is left to manage staggering medical bills, property repair and replacement costs, lost wages, and many other damages without the at-fault party identified or held liable, as they should be. Not to mention, there is a tremendous amount of pain and suffering to endure and normal daily activities may now be impossible to complete. Most often, the victim and other potential witnesses are shaken up following the accident and do not have an opportunity to view and remember the other party's license plate or other identifying information. However, it is important to note that despite these unique difficulties, there is legal redress available. The experienced Boston motorcycle accident lawyers at Bellotti Law Group, P.C. have enjoyed decades of success helping victims and their families obtain rightful compensation following a hit-and-run motorcycle accident. Hit and run cases are intricate and require seasoned and savvy attorneys who have had extensive dealings with insurance companies, medical care providers, rehabilitation centers, employers, and others. We know the tactics insurance companies employ and will not settle until you are offered what you rightfully deserve. Call us today at 617-225-2100 to start recovering your damages and focusing on rehabilitation today. Hit-and-run motorcycle accidents are also unique because they frequently involve both civil and criminal charges. In Massachusetts, when a negligent driver has fled the scene of an accident, which they may do for a number of reasons--including drunk driving, operating with a suspended license, recklessly or negligently speeding, did not have car insurance at the time of the crash, and for any other reason, they face stringent criminal consequences. 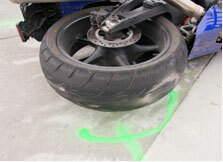 The experienced Boston motorcycle accident attorneys at Bellotti Law Group, P.C. will be in close contact with the prosecutor of the criminal case and keep abreast of all proceedings to best serve you. Even if the negligent, actually liable party has fled the scene of the accident, you still have a claim to file to recover your losses. Our Boston personal injury lawyers have extensive experience working with insurance companies to file a hit-and-run or uninsured motorist claim against your own policy. We advance your uninsured motorist claim to your own insurance company, create a well-evidenced demand package to cover all of your damages, and skillfully negotiate a settlement on your behalf or bring meticulous preparedness to an arbitration or trial to get you what is rightfully yours. Often times, in today's wired world of smart phones, surveillance cameras, and social media, a fleeing at-fault driver can often be traced and will face both criminal and civil charges. Our lawyers will gather any and all information regarding a parallel criminal case, which sometimes includes the judge ordering victim compensation or restitution paid by the defendant to you. Of course, we will also maximize your benefits under the civil case to recoup all of your bills and damages. Motorcycle accidents are devastating enough for victims and their families without having to deal with the added complexities of a hit-and-run. Contact the Boston motorcycle accident lawyers and wrongful death attorneys at Bellotti Law Group, P.C. today at 617-225-2100 to discuss your options. Our offices are in Boston, Cambridge, and Quincy and we have helped countless victims and their families across Massachusetts.